We offer home stay with half board in the nearby towns of Santa Rosa and Villa Realresidences on/off-campus. These towns are just a few minutes from the beach if you take public transportation (which is quite economical) or go by taxi. 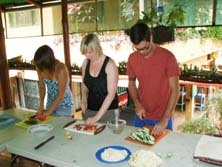 This is a unique opportunity to get to know the culture of Costa Rica in an ideal atmosphere: the homes of the local community. You’ll also get to practice everything you learned in class with your host family.